While much of the drum corps world competed at DCI Kalamazoo in Michigan and at Drums Along the Rockies in Denver this past weekend, West Coast corps continued battling it out in California. The Mandarins and the Cascades represented the World Class in Fremont and Pleasant Hill, Calif. events, but the main focus was on the Open Class. As seven OC corps took the field, the Blue Devils B won both contests with the Santa Clara Vanguard Cadets close behind. Two All-Age corps, the San Francisco Renegades and SoCal Dream of Fountain Valley, Calif. also performed. The Mandarins topped the Cascades by a tenth of a point during the California State Open DCI Tour event in Fremont on Saturday. 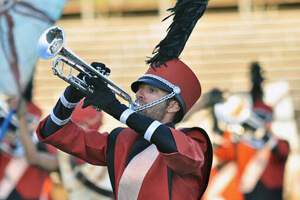 The hard work of each corps was evident on the score sheets as both rose more than a point since their previous competitions — Ogden, Utah for the Cascades and Riverside, Calif. for the Mandarins. One day later at the Loudest Show on Earth in Pleasant Hill, the Mandarins jumped nearly two points, and the Cascades close to another point. There was plenty of excitement in the Open Class as six California-based corps and one Pacific Northwest group competed head-to-head. The defending World Champion Blue Devils B took first place at the Fremont show, passing the nearest competition by more than a point. 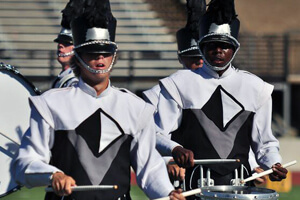 Reminding fans how quickly the competitive tables can turn at any point in the season, however, just a day later the SCV Cadets had closed that gap to only a tenth as they came closer to the undefeated Blue Devils B than anyone has been this season. "Keeping everybody safe and secure for the season is our number one goal, and of course to have a life impacting experience," said Blue Devils B Director Rick Odello. "They're a motivated, competitive group, but I think they're really competing amongst themselves. [The members] are excited, the show is exciting, and the music is motivation enough for them to perform it well." Other performing Open Class corps included Gold from San Diego, Calif., who finished with a score of 76.600 after Sunday's show in Pleasant Hill. Impulse members ended up only a point behind with their show "United." Thunder finished the weekend with a score of 68.500. 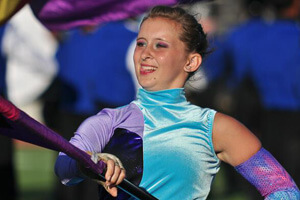 Previously Spokane Thunder, the corps was re-approved for Open Class competition after taking a year off in 2009. "Our primary goal was literally just to get back on the road, to perform, and be in the running," said Thunder Director Rich Harvey. "The veterans have taken the new kids under their wings and shown them the ropes. There were a couple of kids back in March who couldn't play and march at the same time. But they worked and worked, and now they've become leaders on the field. It's been an amazing transformation." Thunder merged with the Cascades organization last year in an effort to strengthen both organizations and build the drum corps activity in the Pacific Northwest. "We're working cooperatively with the Cascades because we think it's important that we align ourselves with other corps in the Northwest," Harvey said. "I think that's the best way drum corps can survive here. We're really enjoying working with them and supporting each other." Following Thunder was Velvet Knights performing the entertaining show "Magical Mystery Tour," and Blue Devils C rounded things out in the Open Class with "Voyage at 'C,'" a rousing show that includes the recognizable "Yo-Ho, Yo-Ho (A Pirate's Life for Me)." In the All-Age class, the Renegades took first at their sponsored event the "Loudest Show on Earth" with their program, "Renegade Planet: A Space Opera." In second place after the weekend's events was SoCal Dream, performing "Necrology." View a photo gallery from the July 10 California State Open. Photos courtesy Chris Maher, corpsreps.com.